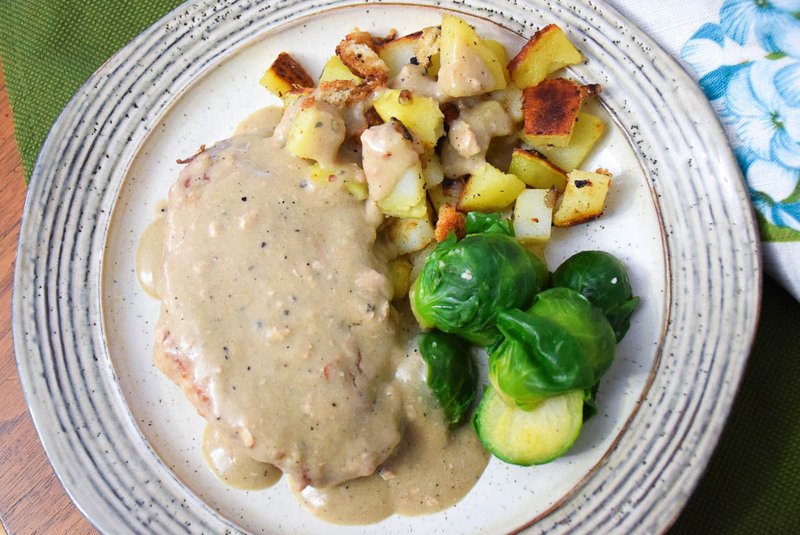 Tender Braised Pork Chops with Country Gravy is an easy pork chop recipe worthy of being called comfort food! 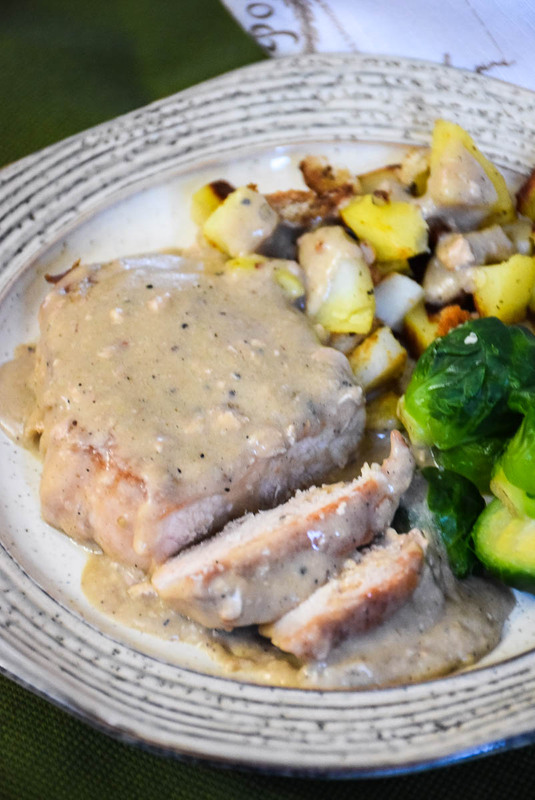 Serve them up with skillet fried potatoes and brussels sprouts for a satisfying warm you up meal! This recipe is super easy and is one that will satisfy your hunger and bring you that homey feeling! Pork chops are a great go-to for quick and easy meals during those busy weeknights also! Grilling them is one of my favorite ways of cooking them in the warmer weather and it is comforting to know that the USDA lowered the cooking temperature for pork to 145 degrees which means you can have a juicier chop with less cooking time! When it comes to braising, however, you usually are cooking your pork for a longer time. Still, even if braising, this is a meal that can be done in a reasonable amount of time if you’re cooking this on a weeknight (about an hour). 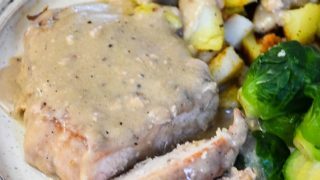 The pork in this recipe comes out so tender and flavorful and the braising gravy is out of this world yummy! It is excellent served over top of some pan-fried potatoes also! What are some of your favorite pork chop recipes? Let me know in the comments below and be sure to check out our Sunday Supper Tastemakers recommendations below! Combine flour, salt, and pepper in a large zip-top plastic bag. Add pork; seal bag and shake to coat pork with flour mixture. Remove pork from bag, reserving remaining flour mixture. Place reserved flour mixture in a small bowl. Gradually add 3/4 cup milk, stirring with a whisk until blended. Add pork; cook 5 minutes on each side or until browned. Add milk mixture; cover, reduce heat to low and cook 30 minutes, stirring occasionally. Turn pork. Stir in 3/4 milk, cover and cook 30 minutes, stirring occasionally. Uncover skillet, and cook pork 15 minutes or until gravy is reduced to 2/3 cup. Spoon gravy over pork. The pork chops look so delicious and I am cracking up over you teasing Grumpy about dinner. Thank you so much for the wonderful things you said about me! I always look forward to your comments and you always brighten my day! I’m so glad we have “met”! This is really cute! I’ll have to get on this meme! The pork looks great – a warming supper, just what we need at this time of year. I love a “light” recipe that doesn’t look light! This looks so delicious! The pork chop recipe does sound like a keeper. You’re so good to Grumpy! I am making pork chops for Randy’s dinner tonight. I will have to try this recipe the next time. It looks tasty. The Pork chops look fabulous! I bet Grumpy was not so grumpy after dinner! What a great pork chop recipe! It looks totally yummy and just right for these chillier nights. Loved the meme. It’s so fun to discover new food bloggers. I love comfort food and what’s more comforting than pork chops and gravy? Great recipe – especially since it’s not full of fat. Yum! Love that country gravy! I switch food around on Phil all of the time. Even tonight. He thought he was getting greek chicken and I made baked corn dogs and fries instead. He actually got pretty excited when he found out he was getting corn dogs. It almost scares me. Your lightened up chops turned out beautiful. I’ll have to surprise the man with them one night. That gravy makes that chop. Works to keep it moist. I’m sure grumpy was happy. You have some good looking chops. reading. Nice blog. I will keep visiting this blog very often. That pork looks nice and moist and good! I just recently starting blogging and came across your blog while visiting another blog. You had me with that gorgeous photo of the pie at the top of your blog. It makes me want a piece of pie NOW! Your pork chop recipe looks very good easy to make. Since I’m Martha challenged, easy is an important factor. I’m going to give it a try next week. Yup – now that porkchop is one good looking porkchop!!! Great recipe and what a fun MEME. HoneyB I enjoyed reading all the nice things you have said about the other bloggers. You have the gift of encouragement and you are very generous with your kindness. I have benefitted greatly from your thoughtfulness with your promotion of my own blog on Stumble Upon. You have put my blog on the map! Your kindness is appreciated! 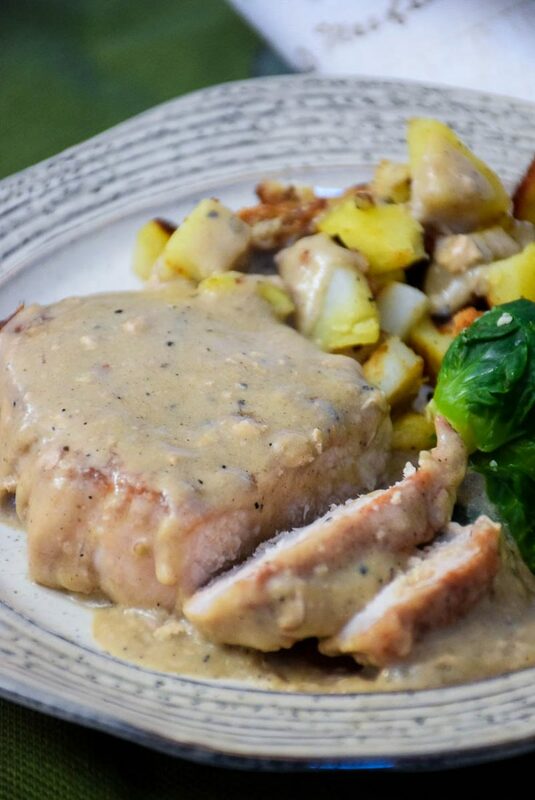 A light recipe for pork chops and gravy, now that’s definitely a keeper :). Awww, you're so sweet! Your answers touched me…I even teared up when I read how I've teared you up. Thanks for being there for me! What a neat meme! I’m ready to go look at their blogs too. I need some cooking light recipes and pork chops are one of my favorite. I can’t wait to try it. Hey HoneyB, I have also tagged you for a meme! The details are on my blog, please come and play! That’s like a dream recipe. Simple, fast to prepare, tasty and importantly, light too! The Food Critic at home is not much of a meat person. Too much meat and we’d stay off it for a while and eat loads of chicken instead so I don’t even know when I’ll be able to try this. I almost never eat pork chops, but these look absolutely delicious!! This looks like a great weekday recipe that the boy in my family will devour. I love that you posted the calories and point values. Thank you! Looks like amazing comfort food! I cannot wait to try it! The hubby doesn’t think I make enough gravy! Your chop recipe must go on our menu!!! YUM! looks like these came out just right! Love the looks of that gravy. Reminds me of dinners at Nana’s house. Looks so good!! Yum I love pork chops with gravy! Sounds like a tasty meal! 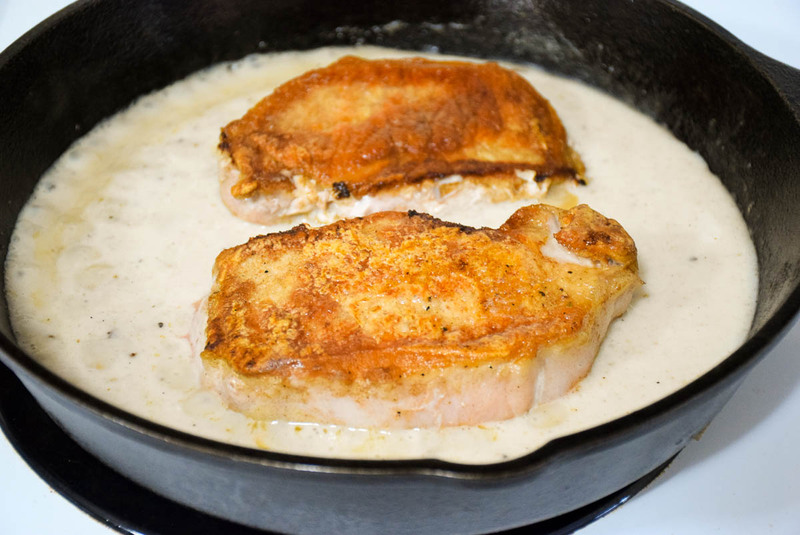 We called this milk gravy I still love it with sausage or breaded chicken too! Thanks for hosting!